Nine gaming notebook manufacturers, ranked from best to worst. Choosing the right notebook is hard, but selecting the perfect gaming laptop is even more challenging. In addition to specs like the processor, graphics card and storage drives, you need to consider the special sauce that each manufacturer adds to its systems in the form of design, software, keyboards and even warranty coverage. When you're potentially investing more than $1,000, the brand matters as much as the specs and features. 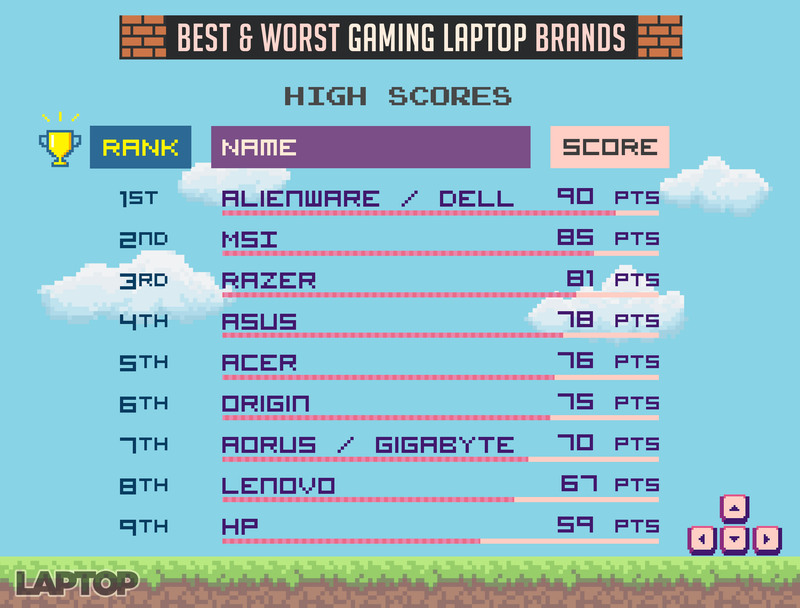 In order to help you choose wisely, we've evaluated the top nine gaming laptop brands and given each a score on a 100-point scale. In order to determine the winners and losers, we rated them on eight different criteria: Design, Review Scores, Keyboards, Displays, Software, Innovation, Warranty and Customization/Selection Options. Due to its consistently high review scores, beautiful displays, willingness to innovate and wealth of configuration options, Dell/Alienware earned first place. MSI took second place, thanks to a diverse lineup of laptops, powerful specs and impressive mechanical keyboards. Razer rounded out the top three, due to its sleek designs and useful software. See how all the best (and worst) gaming laptop brands fared below. Our top-rated brand, Alienware/Dell, has the best-looking laptops with the strongest keyboards and displays on the market. The company also offers some of the most customizable systems around and provides helpful utilities that enable you to play your best. Always the first or one of the first to implement new technologies, MSI has a huge selection of innovative and powerful laptops. The company's strong designs, snappy keyboards and helpful software make it a leader in the gaming space. MSI is also the only company that offers free accidental-damage protection on its laptops. We love Razer's sleek designs, beautiful screens and innovative ideas, and its Synapse software is among the best first-party utilities in the business. However, Razer's shallow keyboards and limited laptop selection hold it back. Asus has some of the most powerful gaming laptops on the market, and many are great values for the money. The company is also quick to implement new technologies like Nvidia's Max-Q standard for low-profile gaming laptops and AMD's Ryzen processors. However, Asus' design, keyboard and screen are all good, but not industry-leading. Acer's strengths are in its responsive keyboards and its innovative ideas (21-inch, curved-screen laptops, anyone?) but its flaws are just as obvious. Its warranty service is lackluster, and the company's preloaded software doesn't stand out. The king of customization, Origin lets you configure your laptop to order, choosing most of the key specs and even opting for different paint jobs. The company's first-party software isn't near the top of the pack, and its one-year limited warranty doesn't include round-trip shipping costs, should you need to send your laptop in for service. Gigabyte has a solid mix of laptops from both of its brands, though the Aorus systems are much sleeker-looking. We also like the colorful displays, snappy keyboards and helpful software on most of the models. However, Gigabyte / Aorus didn't lead the pack in any of our categories and it tied for last place in review scores. With a handful of respectable, but risk-averse, gaming laptops, Lenovo seems like a company that's dipped a couple of toes into the gaming market, but hasn't decided to dive in. The manufacturer's Legion and IdeaPad Y Series notebooks have palatable designs and snappy keyboards, but they don't offer the features serious gamers crave, such as customizable backlighting and high-end Nvidia 1080 graphics. While there are bright spots in HP's Omen line of gaming laptops, the company has made too many compromises, from shallow keyboards to dim displays and boring, plasticky chassis. However, the future looks brighter, since the company now has new, more-promising designs available.